Seconds count in almost any rescue, and that certainly was the case Wednesday afternoon as the Janesville Fire Department saved two young boys from the swift current of the flooded Rock River. 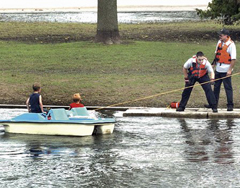 Fire Captain Mike Gang says the boys, ages seven and nine, were in a paddle boat near Traxler Park. "We were able to get their attention, and get them to paddle close enough to us, and throw them a rope," says Gang, adding that the two boys were extremely lucky — a dam is just downstream. "Probably luckier than they&apos;ll ever know. Had another two or three minutes transpired, they probably would have been at the dam." Gang says if they had made it to the dam, there would have been little hope.